Kyo is the only child of his mother and father. His early childhood years were fairly traumatic until he is adopted by Kazuma shortly after his mother's funeral. Kyo's unnamed mother gave birth to him and although she loved him, was afraid of his curse. Kyo's true form made it difficult for even the most over-protective of mothers to come to terms with and she spent much of her time making sure Kyo's bracelet never came off. Kyo, as a child, was confused by her behaviour and was led to believe that she was more afraid of him than anything else. When he grew older, he realised that she did love him but just didn't know how to cope. In the end, she committed suicide because she couldn't handle the stress of being Kyo's mother and having her husband constantly yell at her for her failure. She left a suicide note that said she couldn't come to bear to be around Kyo any longer. Eventually, Kyo comes to the realisation that it was really his father that pushed her over the edge with emotional abuse. He admits to himself in the end that, despite what his feelings were when he was younger, he never wanted his mother to leave him. 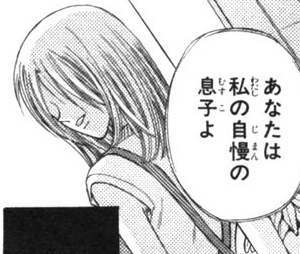 Also unnamed, Kyo's father hated Kyo right from the start. He's a cruel man who felt that it was shameful to have the cursed cat as his son. Kyo would see him yelling at his mother often and in a flashback, we see him blaming her for bringing shame onto him by giving birth to a monster. His emotional abuse is likely what drove Kyo's mother to kill herself and in turn, Kyo's father would blame him for it entirely. He would turn his anger onto Kyo, telling him it was his fault and eventually disowned Kyo altogether. He never refers to Kyo by name, only by "it" or "that monster." At one point, he approaches Kazuma and requests his aid in ensuring that Kyo will be locked away forever after graduation. When Kazuma declines the request, Kyo's father becomes enraged. In the end, he never gets his wish as even Akito disagrees with Kyo's confinement and ends up tearing down the room where Kyo was to be confined. At the end of the series, Kyo confronts his father for a final time and we see that he's in a very bad place. He barely works and he appears to be extremely neurotic and lonely. Still, he tries to blame Kyo for everything and even tries to accuse Kyo of attempting to murder him when Kyo defends himself after being attacked. 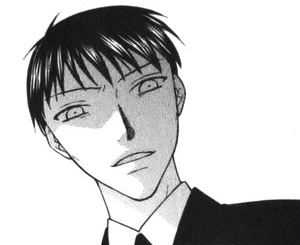 He's even further enraged when Kyo says that he will be living his life as best he can.